This article is about the 2007 railway tunnel. For the 1913 railway and car transport tunnel, see Lötschberg Tunnel. The Lötschberg Base Tunnel (LBT) is a 34.57-kilometre (21.48 mi) railway base tunnel on the BLS AG's Lötschberg line cutting through the Bernese Alps of Switzerland some 400 m (1,312 ft) below the existing Lötschberg Tunnel. It runs between Frutigen, Berne, and Raron, Valais, and was built as one of the two centerpieces of the NRLA project. Breakthrough was in April 2005 and construction ended in 2006. The opening ceremony was in June 2007 Full scale operation began in December 2007, and the link is currently saturated because a single-track section greatly reduces its capacity. Built to ease lorry traffic on Swiss roads, the LBT allows an increased number of lorries and trailers to be loaded onto trains in Germany, pass through Switzerland on rail and be unloaded in Italy. It also cuts down travel time for German tourists going to Swiss ski resorts and puts the Valais into commuting distance to Bern by reducing travel time by 50%. The total cost was SFr 4.3 billion (as of 2007, corrected to 1998 prices). This and the Gotthard Base Tunnel are the two centerpieces of the Swiss NRLA project. Track construction in the LBT was completed in July 2006. Extensive testing then took place, including more than 1,000 test runs, which focused among other things on the use of the ETCS Level 2 system. For the second half of 2007 (after opening), only regular freight used the LBT, plus some international and InterCity passenger trains (without stops between Spiez and Brig); however, passenger trains used the old timetable (the travel time between Spiez and Brig was considered to be 56 minutes until December 2007, even if actual travel time through the LBT was only about 30 minutes). Since February 2008, the LBT has been used for normal InterCity routes. Travel time between Visp and Spiez is about 28 minutes (about 16 minutes in the LBT). Due to the soaring costs of the overall NRLA project, funds were diverted from the Lötschberg tunnel to the Gotthard Base Tunnel; and the LBT is only half finished. The fully complete LBT will consist of two single track bores side by side from portal to portal, connected about every 300 m (984 ft) with cross cuts, enabling the other tunnel to be used for escape. 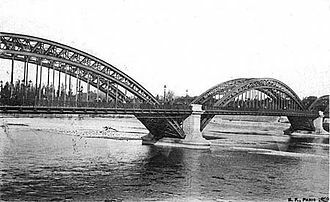 Phase 1: construction of about 75% of the length of the West tube and the complete East tube of the main tunnel, the Engstlige tunnel, the two bridges across the Rhône, and the branch bore from Steg. Tracks are laid in the Eastern tubes of the LBT and Engstlige tunnels, and for some 12 km (7.5 mi) in the western tube of LBT, starting from the South. Phase 2: laying of tracks in the bored but not equipped part of the western tube of LBT, and in the western tube of Engstlige tunnel. Phase 3: construction of the remaining 8 km (5.0 mi) of the western tube, laying tracks on the Steg branch, and connection of this branch to the main line Brig-Lausanne, but towards Lausanne. Phases 2 and 3 may be done together. Completing the LBT is estimated to cost 1 billion Swiss francs. The project also includes two parallel bridges over the river Rhône in canton Valais, the 2.6 km (1.6 mi) Engstlige tunnel (built with cut-and-cover method; the 2 tracks are separated by a wall). A planning contract for phases 2 and 3 was awarded in 2016. About 110 trains per day use the LBT, and 66 have to use the old mountain tunnel because the single track section severely limits the capacity of the base tunnel. Of the 110, 30 are passenger and 80 are freight, including both intermodal freight transport and long-distance heavy freight trains. Heavy freight trains up to a maximum weight of 4,000 tons and a maximum length of 1,500 metres have to use the LBT, as they cannot use the existing mountain track. The 21 km of single track without passing loops greatly complicate operations, and trains are scheduled by batches in each direction separated by long intervals; trains more than 7 minutes late are either routed via the old line or must wait for the next available timetable slot in their direction in the LBT, incurring further delay in either case. The warmth of the water flowing out of the tunnel is used to heat the Tropenhaus Frutigen, a tropical greenhouse producing exotic fruit, sturgeon meat and caviar. ^ Klapper, Bradley S. (2007-06-15). "Swiss Open World's Longest Land Tunnel". Washington Post. Retrieved 11 May 2010. ^ "Huge Swiss tunnel opens in Alps". BBC. 2007-06-15. Retrieved 2007-06-19. Germany, officially the Federal Republic of Germany, is a federal parliamentary republic in central-western Europe. It includes 16 constituent states, covers an area of 357,021 square kilometres, with about 82 million inhabitants, Germany is the most populous member state of the European Union. After the United States, it is the second most popular destination in the world. Germanys capital and largest metropolis is Berlin, while its largest conurbation is the Ruhr, other major cities include Hamburg, Cologne, Stuttgart, Düsseldorf and Leipzig. Various Germanic tribes have inhabited the northern parts of modern Germany since classical antiquity, a region named Germania was documented before 100 AD. During the Migration Period the Germanic tribes expanded southward, beginning in the 10th century, German territories formed a central part of the Holy Roman Empire. 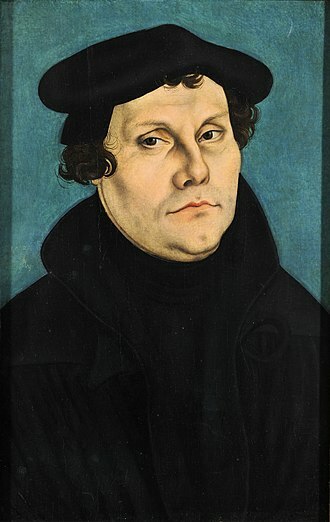 During the 16th century, northern German regions became the centre of the Protestant Reformation, in 1871, Germany became a nation state when most of the German states unified into the Prussian-dominated German Empire. After World War I and the German Revolution of 1918–1919, the Empire was replaced by the parliamentary Weimar Republic, the establishment of the national socialist dictatorship in 1933 led to World War II and the Holocaust. After a period of Allied occupation, two German states were founded, the Federal Republic of Germany and the German Democratic Republic, in 1990, the country was reunified. In the 21st century, Germany is a power and has the worlds fourth-largest economy by nominal GDP. As a global leader in industrial and technological sectors, it is both the worlds third-largest exporter and importer of goods. Germany is a country with a very high standard of living sustained by a skilled. It upholds a social security and universal health system, environmental protection. Germany was a member of the European Economic Community in 1957. It is part of the Schengen Area, and became a co-founder of the Eurozone in 1999, Germany is a member of the United Nations, NATO, the G8, the G20, and the OECD. BLS AG is a Swiss railway company created by the 2006 merger of BLS Lötschbergbahn and Regionalverkehr Mittelland AG. It is 55. 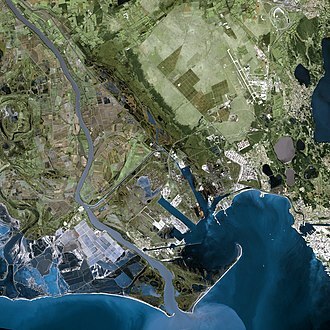 8% owned by the Canton of Berne and it has two main business fields, passenger traffic and infrastructure. BLS has a subsidiary BLS Cargo which is responsible for all freight operations, BLS Cargo works in cooperation with the freight subsidiary of Deutsche Bahn, Railion. However, the staff, apart from management and sale, is employed by BLS AG, part of the BLS locomotive fleet is owned by BLS Cargo. In 2007 the new,34.6 km long, Lötschberg base tunnel opened, for details of the network see the map at right. 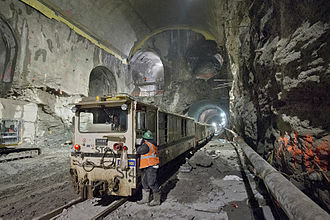 The Lötschberg base tunnel was built by a wholly owned subsidiary BLS AlpTransit AG, by mid-2007 this company handed over the base tunnel to BLS AG. As of 2012, BLS was planning BLS to spend around SFr1·2bn on new rolling stock by 2025, since the merger, BLS has been the exclusive operator of the standard gauge part of the S-Bahn Bern. This includes open access services over Swiss Federal Railways and STB Sensetalbahn tracks, since December 2007 BLS offers a new RegioExpress service over the old Lötschberg route while most SBB and Cisalpino, InterCity, and EuroCity trains use the new Lötschberg tunnel. ETCS requires standard trackside equipment and a standard controller within the train cab. In its final form, all information is passed to the driver electronically, removing the need for lineside signals that, at high speed. It is a requirement that all new, upgraded or renewed tracks and rolling stock in the European railway system should adopt ETCS. Many networks outside the EU have adopted ETCS, generally for high-speed rail projects, ETCS is specified at four different levels, Level 0, ETCS-compliant locomotives or rolling stock interact with lineside equipment that is non-ETCS-compliant. Versions are called System Requirement Specification and this is a bundle of documents, which may have different versioning for each document. A main version is called Baseline, unfortunately was a long time no strait release management and so exists no clear numbering scheme and hidden differences in practical installation until BL3. The European railway network grew from separate national networks with more in common than standard gauge. Notable differences include voltages, loading gauge, signalling, both factors led to efforts to reduce the time and cost of cross-border traffic. On 4 and 5 December 1989, a group including Transport Ministers resolved a master plan for a trans-European high-speed rail network. The Commission communicated the decision to the European Council, which approved the plan in its resolution of 17 December 1990 and this led to a resolution on 91/440/EEC as of 29 July 1991, which mandated the creation of a requirements list for interoperability in high-speed rail transport. The rail manufacturing industry and rail network operators had agreed on creation of interoperability standards in June 1991, until 1993 the organizational framework was created to start technical specifications that would be published as Technical Specifications for Interoperability. 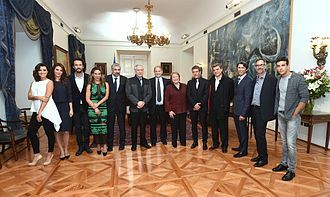 The mandate for TSI was resolved by 93/38/EEC, in 1995 a development plan first mentioned the creation of the European Rail Traffic Management System. The specification was written in 1996 in response to EU Council Directive 96/48/EC99 of 23 July 1996 on interoperability of the trans-European high-speed rail system, in July 1998 SRS 5a documents were published that formed the first baseline for technical specifications. UNISIG provided for corrections and enhancements of the baseline specification leading to the Class P specification in April 1999 and this baseline specification has been tested by six railways since 1999 as part of the ERTMS. The railway companies defined some extended requirements that were included to ETCS, the SUBSET-026 is defined from eight chapters where chapter seven defines the ETCS language and chapter eight describes the balise telegram structure of ETCS Level 1. Later UNISIG published the corrections as SUBSET-108, that was accepted in decision 2006/679/EEC, the earlier ETCS specification contained a lot of optional elements that limited interoperability. The Class 1 specifications were revised in the year leading to SRS2.3.0 document series that was made mandatory by the European Commission in decision 2007/153/EEC on 9 March 2007. The city of Bern or Berne is the de facto capital of Switzerland, referred to by the Swiss as their Bundesstadt, or federal city. With a population of 141,762, Bern is the fourth-most populous city in Switzerland, the Bern agglomeration, which includes 36 municipalities, had a population of 406,900 in 2014. The metropolitan area had a population of 660,000 in 2000, Bern is the capital of the canton of Bern, the second-most populous of Switzerlands cantons. The official language in Bern is German, but the language is an Alemannic Swiss German dialect. In 1983, the old town in the centre of Bern became a UNESCO World Heritage Site. Bern is ranked among the top ten cities for the best quality of life. 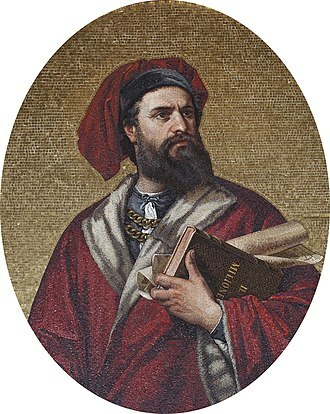 The etymology of the name Bern is uncertain and it has long been considered likely that the city was named after the Italian city of Verona, which at the time was known as Bern in Middle High German. As a result of the find of the Bern zinc tablet in the 1980s, it is now common to assume that the city was named after a pre-existing toponym of Celtic origin. The bear was the animal of the seal and coat of arms of Bern from at least the 1220s. The earliest reference to the keeping of bears in the Bärengraben dates to the 1440s. No archaeological evidence that indicates a settlement on the site of city centre prior to the 12th century has been found so far. In antiquity, a Celtic oppidum stood on the Engehalbinsel north of Bern, fortified since the second century BC, during the Roman era, a Gallo-Roman vicus was on the same site. The Bern zinc tablet has the name Brenodor, in the Early Middle Ages, a settlement in Bümpliz, now a city district of Bern, was some 4 km from the medieval city. The medieval city is a foundation of the Zähringer ruling family, according to 14th-century historiography, Bern was founded in 1191 by Berthold V, Duke of Zähringen. In 1218, after Berthold died without an heir, Bern was made an imperial city by the Goldene Handfeste of Holy Roman Emperor Frederick II. In 1353, Bern joined the Swiss Confederacy, becoming one of the eight cantons of the period of 1353 to 1481. In rail transport, track gauge is the spacing of the rails on a railway track and is measured between the inner faces of the load-bearing rails. All vehicles on a network must have running gear that is compatible with the track gauge, as the dominant parameter determining interoperability, it is still frequently used as a descriptor of a route or network. There is a distinction between the gauge and actual gauge at some locality, due to divergence of track components from the nominal. Railway engineers use a device, like a caliper, to measure the actual gauge, the nominal track gauge is the distance between the inner faces of the rails. In current practice, it is specified at a distance below the rail head as the inner faces of the rail head are not necessarily vertical. 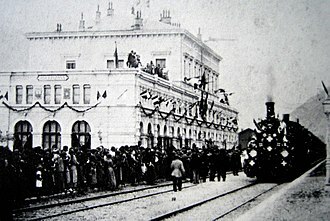 In some cases in the earliest days of railways, the company saw itself as an infrastructure provider only. Colloquially the wagons might be referred to as four-foot gauge wagons and this nominal value does not equate to the flange spacing, as some freedom is allowed for. An infrastructure manager might specify new or replacement track components at a variation from the nominal gauge for pragmatic reasons. Track is defined in old Imperial units or in universally accepted metric units or SI units, Imperial units were established in United Kingdom by The Weights and Measures Act of 1824. In addition, there are constraints, such as the load-carrying capacity of axles. Narrow gauge railways usually cost less to build because they are lighter in construction, using smaller cars and locomotives, as well as smaller bridges, smaller tunnels. Narrow gauge is often used in mountainous terrain, where the savings in civil engineering work can be substantial. Broader gauge railways are generally expensive to build and require wider curves. There is no single perfect gauge, because different environments and economic considerations come into play, a narrow gauge is superior if ones main considerations are economy and tight curvature. For direct, unimpeded routes with high traffic, a broad gauge may be preferable, the Standard, and 46 gauges are designed to strike a reasonable balance between these factors. Geothermal energy is heat energy generated and stored in the Earth. Thermal energy is the energy determines the temperature of matter. The geothermal energy of the Earths crust originates from the formation of the planet. The adjective geothermal originates from the Greek roots γη, meaning earth, Earths internal heat is thermal energy generated from radioactive decay and continual heat loss from Earths formation. Temperatures at the boundary may reach over 4000 °C. Rock and water is heated in the crust, sometimes up to 370 °C, from hot springs, geothermal energy has been used for bathing since Paleolithic times and for space heating since ancient Roman times, but it is now better known for electricity generation. Worldwide,11,700 megawatts of power is online in 2013. An additional 28 gigawatts of geothermal heating capacity is installed for district heating, space heating, industrial processes, desalination. 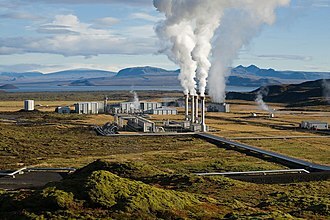 Geothermal power is cost-effective, reliable and environmentally friendly, recent technological advances have dramatically expanded the range and size of viable resources, especially for applications such as home heating, opening a potential for widespread exploitation. Geothermal wells release greenhouse gases trapped deep within the earth, as a result, geothermal power has the potential to help mitigate global warming if widely deployed in place of fossil fuels. The Earths geothermal resources are more than adequate to supply humanitys energy needs. Drilling and exploration for resources is very expensive. Forecasts for the future of geothermal power depend on assumptions about technology, energy prices, plate boundary movement, pilot programs like EWEBs customer opt in Green Power Program show that customers would be willing to pay a little more for a renewable energy source like geothermal. But as a result of government assisted research and industry experience, in 2001, geothermal energy costs between two and ten US cents per kWh. Hot springs have been used for bathing at least since Paleolithic times, the oldest known spa is a stone pool on Chinas Lisan mountain built in the Qin Dynasty in the 3rd century BC, at the same site where the Huaqing Chi palace was built. A truck is a motor vehicle designed to transport cargo. Trucks vary greatly in size and configuration, smaller varieties may be similar to some automobiles. Commercial trucks can be large and powerful, and may be configured to mount specialized equipment, such as in the case of fire trucks and concrete mixers. Modern trucks are powered by diesel engines, although small to medium size trucks with gasoline engines exist in the US. In the European Union, vehicles with a gross mass of up to 3.5 t are known as light commercial vehicles. Trucks and cars have an ancestor, the steam-powered fardier Nicolas-Joseph Cugnot built in 1769. However, steam wagons were not common until the mid-1800s, the roads of the time, built for horse and carriages, limited these vehicles to very short hauls, usually from a factory to the nearest railway station. The first semi-trailer appeared in 1881, towed by a tractor manufactured by De Dion-Bouton. In 1895 Karl Benz designed and built the first truck in history using the internal combustion engine, that year some of Benzs trucks were modified to become the first bus by the Netphener, the first motorbus company in history. A year later, in 1896, another internal combustion engine truck was built by Gottlieb Daimler, other companies, such as Peugeot, Renault and Büssing, built their own versions. The first truck in the United States was built by Autocar in 1899 and was available with optional 5 or 8 horsepower motors, trucks of the era mostly used two-cylinder engines and had a carrying capacity of 3,300 to 4,400 lb. In 1904,700 heavy trucks were built in the United States,1000 in 1907,6000 in 1910, after World War I, several advances were made, pneumatic tires replaced the previously common full rubber versions. Electric starters, power brakes,4,6, and 8 cylinder engines, closed cabs, the first modern semi-trailer trucks appeared. Touring car builders such as Ford and Renault entered the heavy truck market, although it had been invented in 1890, the diesel engine was not common in trucks in Europe until the 1930s. In the United States, it took longer for diesel engines to be accepted. The word truck might come from a back-formation of truckle, meaning small wheel or pulley, from Middle English trokell, another possible source is the Latin trochus, meaning iron hoop. A railway electrification system supplies electric power to railway trains and trams without an on-board prime mover or local fuel supply. Electrification has many advantages but requires significant capital expenditure, selection of an electrification system is based on economics of energy supply and capital cost compared to the revenue obtained for freight and passenger traffic. 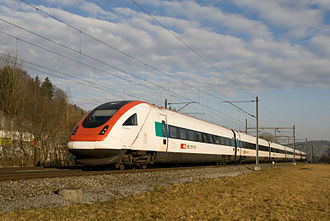 Different systems are used for urban and intercity areas, some electric locomotives can switch to different supply voltages to allow flexibility in operation, Electric railways use electric locomotives to haul passengers or freight in separate cars or electric multiple units, passenger cars with their own motors. Electricity is typically generated in large and relatively efficient generating stations, transmitted to the railway network, some electric railways have their own dedicated generating stations and transmission lines but most purchase power from an electric utility. The railway usually provides its own lines and transformers. Power is supplied to moving trains with a continuous conductor running along the track usually takes one of two forms. The first is a line or catenary wire suspended from poles or towers along the track or from structure or tunnel ceilings. Locomotives or multiple units pick up power from the wire with pantographs on their roofs that press a conductive strip against it with a spring or air pressure. Examples are described in this article, the second is a third rail mounted at track level and contacted by a sliding pickup shoe. Both overhead wire and third-rail systems usually use the rails as the return conductor. In comparison to the alternative, the diesel engine, electric railways offer substantially better energy efficiency, lower emissions. Electric locomotives are usually quieter, more powerful, and more responsive and they have no local emissions, an important advantage in tunnels and urban areas. Different regions may use different supply voltages and frequencies, complicating through service, the limited clearances available under catenaries may preclude efficient double-stack container service. The canton of Bern is the second largest of the 26 Swiss cantons by both surface area and population. Located in west-central Switzerland, it borders the canton of Jura, to the west lie the canton of Neuchâtel, the canton of Fribourg and Vaud. To the south lies the canton of Valais, east of the canton of Bern lie the cantons of Uri, Obwalden and Aargau. The canton of Bern is bilingual and has a population of 1,017,483, as of 2007, the population included 119,930 foreigners. The cantonal capital, the capital of Switzerland, is Bern. Bern joined the Swiss Confederation in 1353 and was between 1803 and 1814 one of the six directorial cantons of the Napoleonic Swiss Confederation and these caves were used at various times during the last ice age. The first open-air settlement in the area is an upper paleolithic settlement at Moosbühl in Moosseedorf, during the warmer climate of the mesolithic period, increasing forest cover restricted the movement of hunters and gatherers. Their temporary settlements were built along lake and marsh edges, which remained free of trees due to fluctuations in water level, important mesolithic sites in the Canton are at Pieterlenmoos and Burgäschisee lake along with alpine valleys at Diemtig and Simmental. During the neolithic period, there were a number of settlements on the shores of Lake Biel, several of these sites are part of the Prehistoric Pile dwellings around the Alps, a UNESCO World Heritage Site. One of the best explored neolithic sites is at Twann, in the Twannbach delta there were about 25 Cortaillod culture and Horgen culture villages that existed between 3800 and 2950 BC. One of the oldest examples of bread from Switzerland, a sourdough from 3560–3530 BC, simple copper objects were already in use in the 4th millennium BC, including a copper pin from Lattrigen from 3170 BC and a knife blade from Twann. Shortly before 2000 BC bronze production entered the area and brought about a surge in development, settlements began to spread into the pre-Alpine and Alpine areas. The area between Lake Thun and the Niedersimmental were densely settled, Late Bronze Age settlements along Lake Biel have yielded up a wealth of items. During the early Iron Age changes in climate forced them to settlements along many waterways and in the valley floors and move to the plateaus. Frutigen is a municipality in the Bernese Oberland in the canton of Bern in Switzerland. It is the capital of the Frutigen-Niedersimmental administrative district, the area around Frutigen may have been settled since possibly the Bronze age or Roman times. It is first mentioned in 1234 as Frutingen, during the Middle Ages there were three castles in the modern municipal border, Tellenburg and Bürg. By 1260 the scattered farmers of the floor had formed a political. The association had its own seal in 1263 and in 1340 it negotiated a peace with an association in the Obersimmental, in 1391, the village of Frutigen gained the right to hold the low court in the village. In 1400, the expanding city-state of Bern annexed the entire valley, the association was powerful enough to force Bern to make concessions. 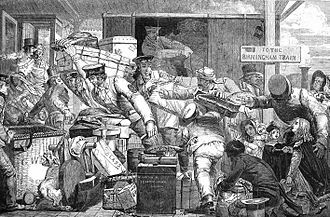 The residents of the valley were freed from the obligation to pay taxes or provide labor for local lords, the valley held onto these freedoms until 1854. The village church, Saint Quirinus church, was first mentioned in 1228 as one of the churches around Lake Thun in the Strättliger Chronicle. However, this church was built over the foundation of an older church, the earliest church was probably built in the 8th or 9th century above 7th or 8th century tombs. The original church was replaced in the 11th or 12th century and that church was rebuilt in 1421. The current church was built on the ruins of the 1421 church following a fire in 1727, in 1528, Bern adopted the Protestant Reformation and began imposing it on the Canton. Frutigen, like the rest of the Bernese Oberland, resisted the new faith, the large parish of Frutigen was divided several times but still includes the villages of Schwandi and Wengi which are both part of the municipality of Reichenbach. A Roman Catholic parish church was built in 1959, the Catholic Frutigen parish covers approximately the same area as the medieval parish. The valley had always profited from trade over the Gemmi and Lötschen Passes, a sust or warehouse and mountain pass way station was built in Kanderbrück in the 16th century, though similar buildings existed since at least the Middle Ages. Art Nouveau Silver Medallion by Giannino Castiglioni for the Milan International Exhibition 1906. The South Portal of the Simplon Tunnel is on the obverse. 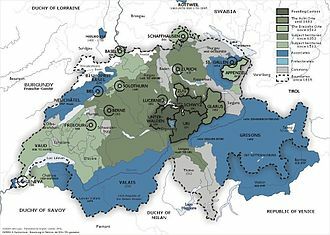 The Old Swiss Confederacy from 1291 (dark green) to the sixteenth century (light green) and its associates (blue). In the other colours are shown the subject territories. Example of integrated timetables between interregional and regional services on the Swiss network. The two trains are programmed to meet in the hub of Geneva at 15:30, sharing a platform, to minimise transfer times. Narrow gauge work train in an East Side Access cavern that will eventually house a standard gauge station for the Long Island Rail Road. The New York City Subway is the world's largest single operator rapid transit system by number of stations served, utilizing hundreds of miles of electrified track. Nottingham Express Transit in the United Kingdom uses a 750 V DC overhead, in common with most modern tram systems. The Rhône Glacier above Oberwald, Switzerland is the source of the river. View of Bern from the ISS; The Old City is in the lower right-hand side. Schweizerische Nationalbank (Swiss National Bank), 5 francs (1914). The portrait depicts William Tell (based on Richard Kissling’s monument in Altdorf), with the Rütli Mountain in the distance. ETCS—"Eurobalise" transceiver, installed between rails, provides information to ETCS trains. A double-track railway line running through a wooded area. Decorative exterior wall, Mexico City, Mexico, 2008. Wall of a deserted house in Kissos (Greece). Containers being transferred to a cargo ship at the container terminal of Bremerhaven. Intermodal ship-to-rail transfer of containerized cargos at APM Terminals in Portsmouth, Virginia. Stagecoach transferred to a rail car with a simple Portainer, an example of early intermodal freight transport by the French Mail, 1844. The drawing is exhibited in Deutsches Museum Verkehrszentrum, Munich, Germany. An ICE-T (DB class 411) leaves a curve, showing cars tilted to different degrees. The JR N700 Series Shinkansen, the first tilting train on Japan's high speed network. BLS Re 485 014-5 in Spiez, 18 February 2006. Banderas with Melanie Griffith at the Shrek Forever After premiere in May 2010.